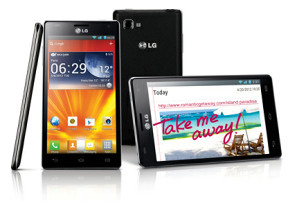 The LG Optimus 4X HD comes in an extra solid cardboard box with a slip-on lid with glossy black 4X imprints. Inside you'll find the handset, a standalone charger piece with removable USB cable, a white set of headphones and two NFC tags labeled Office and Car. What's missing is a memory card, although the inbuilt storage of 16 GB is more than enough to get you started. Some extra pairs of different-size earbuds to use with the headset would've been nice but it's not a big deal. An MHL TV-out adapter is missing too - that's almost never part of the standard equipment of smartphones, at least on our side of the pond. The LG Optimus 4X HD is a large handset but, after all, size has a lot to do with whether or not you're well received in the Android big league. With virtually the same screen diagonal and overall dimensions as the main competitors, the LG 4X HD is styled to stand out and we're about to see how space-efficient and comfortable to handle it is. At 132.4 x 68.1 x 8.9 mm, the LG 4X HD goes strictly by the rulebook of the Flagship Club and is right on the money at 133 g.
The Optimus 4X HD is almost entirely made of plastic, which is the logical choice considering the size of the phone and the number of antennas inside. Just like the HTC One X and the Samsung Galaxy S III, the LG 4X HD does well to fit a massive HD screen in an ultra-slim body and keeps the weight within perfectly reasonable limits. It is in fact small touches and design choices that set the three Android flagships apart. The LG smartphone easily stands out with its assertive, angular styling. What LG call the prism-edged design couldn't have been more different than the subtly curved bodies of both the HTC One X and the Galaxy S III. The 4X HD has a distinctly more solid feel in the hand. Although it weighs exactly the same as the Galaxy S III, the well-defined edges give an impression of almost tangible extra heft. The sides of the phone have a peculiar dual frame, which looks nice, but in a way compromises the secure grip. Overall, the LG 4X HD is a strange mix of experiences. It makes the Samsung Galaxy S III, which is the biggest phone of the bunch, feel almost flimsy and slippery to hold. On the other hand, it doesn't even come close to the comfortable and secure feel of the polycarbonate unibody of the HTC One X. The LG 4X HD flaunts a 4.7" Gorilla Glass-covered screen with a resolution of 1280 x 720 pixels. LG call it a True-HD display and it essentially uses the same technology as the second-generation IPS LCD of the HTC One X. The 720p resolution equates to around 312 pixels per inch and the images are impressively detailed and crisp. 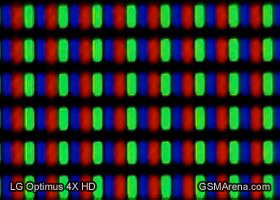 The display of the LG 4X HD is brighter than AMOLED and uses a RGB matrix with a full set of subpixels, as opposed to the PenTile panel in AMOLED. The True-HD IPS display of the LG 4X HD is a standard-setting LCD unit. Images are pleasingly sharp and even small fonts are crisp and readable. It cannot really match the deep blacks of AMOLED and the resulting contrast, but it's doing quite well in its own division. The colors appear a little less saturated than on the HTC One X but don't look bad by any means. The glass covering the display is very reflective and it seems the screen could've been a bit closer to the surface. The sunlight legibility is below (but not by far) AMOLED standards and that was hardly a surprise. The HTC One X, which uses very similar display technology, does a little better in terms of viewing angles and outdoor performance. Here go the LG Optimus 4X HD results from our display tests. You can find more about the testing procedures over here. Above the 4.7" screen is the earpiece, along with proximity and ambient light sensors. There's a 1.3 MP front-facing camera too, although the phone doesn't natively support video calls. Another thing missing is a notification LED - both the One X and the Galaxy S III have one. 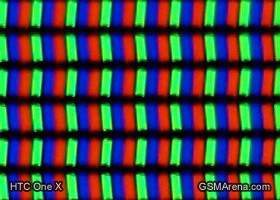 We snapped a shot of the display under a microscope - here is how the RGB matrix of the 4X HD compares to the one on HTC's One X. Below the screen are the three capacitive controls - Back, Home and Menu - which usually stay out of the way until lit up by a tap on the screen. A dedicated setting lets you have the keys backlight always on. A bit of a surprise, the white backlight of the capacitive keys doesn't get lost against the background of our all-white 4X HD. Just the opposite, it looks quite cool, especially at night. On the left side of the phone there's a volume rocker, which will be hard to spot, but otherwise comfortable to locate by touch and solid on press. The right side of the Optimus 4X HD has no controls. A 3.5 mm headphones jack and a secondary microphone go with the power/lock button at the top side. At the bottom, we find the centrally placed microUSB port, along with the main microphone in the corner. The microUSB port allows HD TV output with the right MHL adapter. You'll also notice a tiny slit in the back panel, which is the point of entry for your nail to pull the battery cover open. Around back we see the 8 MP camera lens along with a single LED flash and a loudspeaker grille at the bottom. The back panel is the part of the phone's design we're least impressed with. The leather-like texture looks and feels cheap - and that has nothing to do with the quality of the plastic used. It just seems a bit tacky, and doesn't go too well with the glass-covered front. By comparison, the HTC One X feels special without trying too hard - which should be the right way to go about getting a premium feel. With the four cores inside the LG Optimus 4X HD at full blast, the phone will occasionally heat up around the LG logo at the back but it doesn't look like a major issue that will adversely affect the phone's performance. Undoing the back panel reveals the regular-sized SIM card slot, a microSD card slot, the NFC antenna (on the back panel itself) and a powerful 2150 mAh Li-Ion battery. Nominally, it's the biggest battery to be found in a quad-core phone, although the difference to the Galaxy S III's 2100 mAh unit is negligible. What more impressive here is the new SiO+ battery technology, which has allowed LG to get up to 6% more power out of a regular-size battery pack. 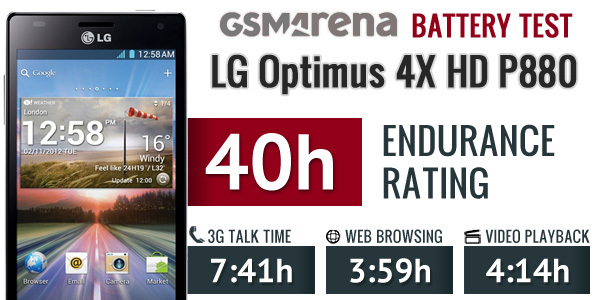 The ample juice pack allowed the LG Optimus 4X to do pretty well in our dedicated battery life test. The smartphone scored a good overall score of 40h, which means that you'd need to be charging it every other night if you use it for an hour of telephony, an hour of video playback and an hour of web browsing per day. Aesthetically, the LG Optimus 4X HD has almost nothing in common with its dual-core predecessor. The new trend towards huge screens and slim bodies is something we really love and we are glad LG is finally following suit. The angular shape of the Optimus 4X HD earns it a few and does well to set the LG flagship apart from its main competitors. Granted the designers didn't have perfect success in mixing different elements and balancing different influences at the back, but we generally like how the Optimus 4X HD looks and feels. Okay, it doesn't fit in the hand as well as the curved back of the Galaxy S III, but LG has still done good job with its handling, given the size of the smartphone. And you shouldn't forget the other aspects of a phone's design and build. Unlike the One X, the LG 4X HD has a removable battery (using a new advanced technology at that) and expandable memory. These will always be advantages in our book. Now, let's move on to software where the real difference is to be made yet again.